For personal or professional use, the black Pelican StealthLite 2450 Rechargeable Flashlight is a simple and reliable tool built from quality components and safety-certified for hazardous conditions. A three-hour charge will power the 35-lumen Xenon incandescent bulb for 3.5 hours; the wall-mountable charger can operate on AC power at home or at work, or can be plugged into a vehicle's DC power socket. 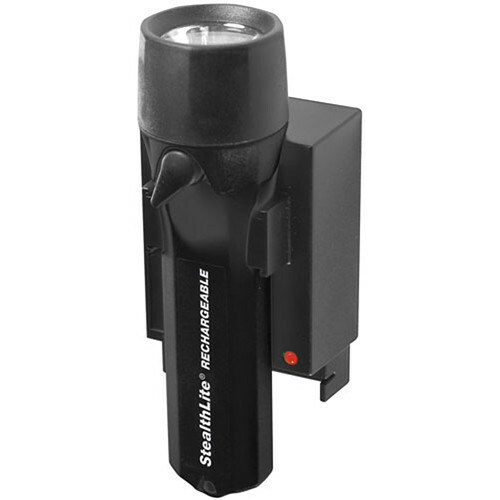 The StealthLite's housing is ABS plastic, its shroud is K-Resin, and its lens is polycarbonate. Sealed with an ethylene propylene O-ring, the light is submersible and rated IPX7. It runs on a rechargeable NiMH battery pack, but 4 AA alkaline batteries can also be used. Box Dimensions (LxWxH) 10.0 x 10.0 x 2.75"